It seems our tree dwelling feathered friends have taken a giant leap (or flap) forward when it comes to their homes whilst inspiring a bit of social commentary on how the most powerful leaders of the world have impacted their people. 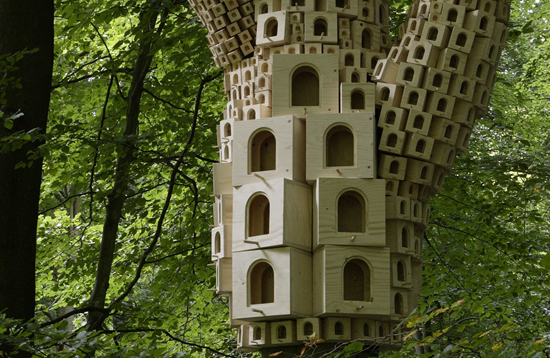 Super Kingdom is an art installation in Kent's Wood, Kent consisting of a series of fully functional birdhouses (or rather bird mansions) based on infamous dictators throughout history and the palaces they built. This picture here is a bird house mimicking Mussolini's Palazzo della Civilta Italiana. 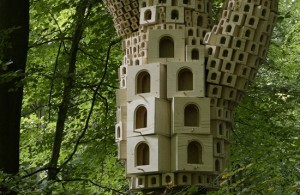 Created by artists Bruce Gilchrist and Jo Joelson from London Fieldworks the structures are part of a broader project by the pair who plan to make a film about the different animals that decide to take up resident in the bird houses. This is intended to reflect how urban development across the globe has affected (often displaced) groups of humans and animals alike. Other birdhouses in the series include an inverted pyramid based on Stalin's supposed gift to Warsaw, Poland as well as communist dictator Nicolae Ceausescu's Palace of Parliament in Bucharest, Romania. 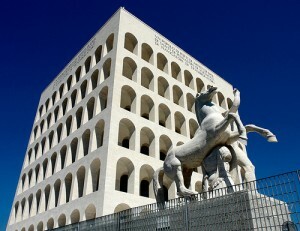 The real Palazzo della Civilta Italiana.